After switching back to the Visual Designer, select the employeeNumber text box and type +data under the 'Find Property' table on the far right hand side. 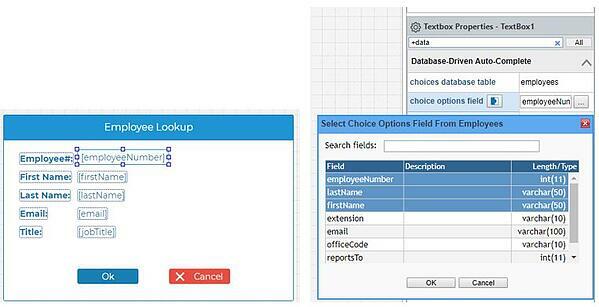 Then type employees in the 'choices database table' property. Below that highlight the 'choice options field' table and click the '...' button. You will see multiple choices to choose from, select the first 3 options (employeeNumber, lastName, and firstName) and click OK and then Save. 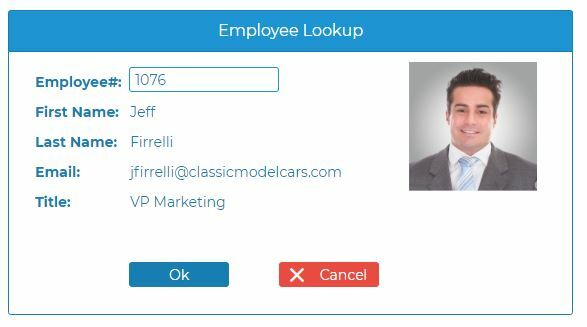 Test your auto-complete feature by launching the application in a separate browser and begin typing a value in the Employee # box to see if it begins to auto-complete for you. Begin by clicking on the 'All Widgets' tab and dragging the image widget on to your panel widget. Highlight the image widget and scroll down to 'Field Settings' in the Image Properties and select 'Image Source' (you can also use the 'Find Property' search bar and type in Image Source to go directly there). 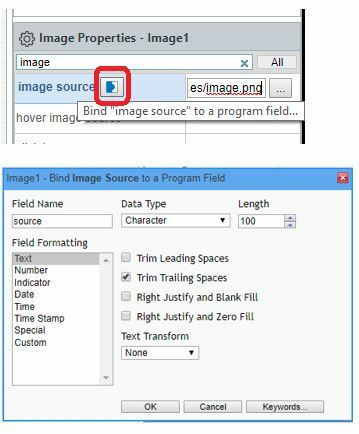 Click on the 'Image Source' option and bind that property to the field name source. 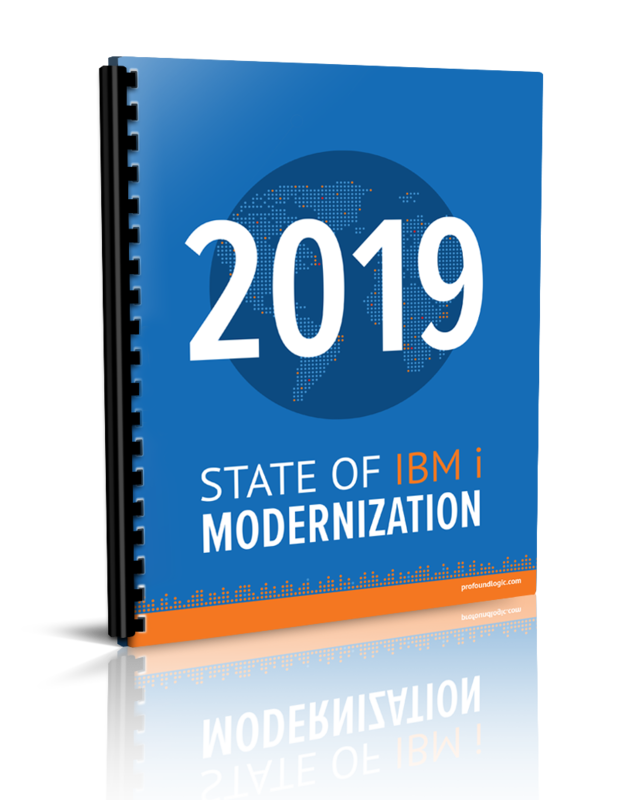 This quick and easy exercise has now given you a dynamic way to view employee records with little development effort. 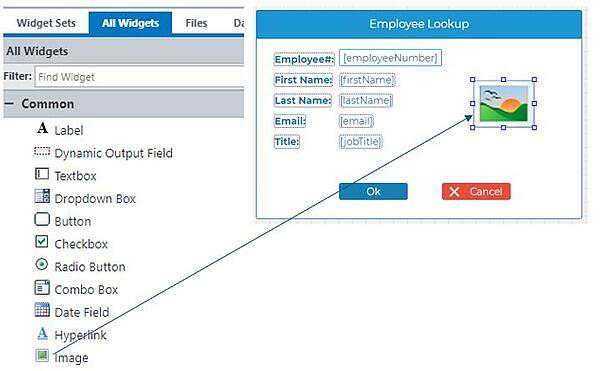 In our next post we will learn how to use NodeRun to create a rich and complex grid based application that helps you list all of your employees. If you missed it, our Guided Lab: Employee Data Application Part 1 showed you how to build your employee lookup application from scratch.